This is a 1911A1 cut-away drawing in high detail. If you have an interest in the M1911A1 pistol, this is an excellent resource. 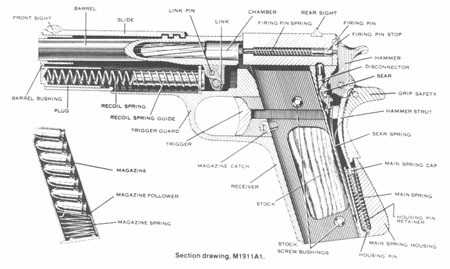 The 1911A1 cut-away drawing shows all of the internal details of the classic pistol. This is a 1911A1 cut-away drawing, not a 1911 cut-away drawing. However, most of the changes between the two do not have any bearing on this 1911A1 cut-away drawing.